Our friend Jess wrote us looking for a bit of inspiration for her new home. She lives with her husband and adorable 1 year old son and hasn’t had the chance to do all the things they want to the home yet – I think we can all relate! They have some great ideas on upgrading the kitchen and dining area, so I decided to focus on ideas for the family room. Here is the room now. For most families, this room is the heart of the home (assuming the kitchen is the soul!). We spend so much time in the family room lounging around, entertaining guests, spending holidays and crawling around on the floor with little ones. It needs to be comfortable and practical, but that doesn’t mean you have to throw style out the window! For Jess’s family room makeover, I combined earth tones with a variety of textiles and personal touches to make the room one her family will enjoy for years to come. Any good room starts with paint color, and for those that know us best know that we love gray. Our last home had 5 different shades of it. I love Collonade Gray, Modern Gray, City Loft and Agreeable Gray from Sherwin Williams. Of course Home Depot or Lowes can also color match any of these colors. They may look dark on the swatches, but they aren’t quite that stark once they are up. I would suggest getting at least 4 options and painting a splash of them on the walls before deciding which you like best. Another important foundational piece of the room will be the flooring. Jess mentioned replacing the flooring in the kitchen, dining and family areas with a wide plank wood floor. We love that idea and think it would be perfect for the rooms. BuildDirect has a great selection of wide plank flooring with very competitive prices. I’m loving the gray wash floors right now and this Oak Seashell Gray Engineered floor is actually on clearance right now! Now you have painted walls and wood floors – on to the fun stuff! 1. The first piece to focus on after floors and paint will be the fireplace mantel. Keeping the existing black elements of the fireplace, you can frame in the fireplace and add a mantel to add more interest and substance – making it a true focal point of the room. You’ll need to be pretty handy to make this a DIY project, but it’s doable! You can also find a carpenter in your area to quote you for the project. Make sure to see samples of their work before hiring them! You can see our mantel makeover here. 2. With the wood floors, you’ll want a nice rug for the kiddos to crawl around on. This will also add warmth to the room in the cool winter months. Wayfair has some great selections and good prices. 3. The family room is the perfect place for an art collage wall. This can include wedding pictures, kid drawings, favorite prints and photographs of your adventures. Maybe even a framed marathon bib! For more art wall ideas, check out our past post. 4. I love the trestle table trend right now, and think these pieces are classic and only look better as they get worn in. This one is from Home Decorators. Their prices are affordable, which is perfect for a piece that will be used and abused by the whole family. 5. I’m slightly obsessed with poufs and cubes right now. These are from West Elm and come in a variety of colors and sizes. They are perfect for extra seating on the fly as well as little impromptu tables. Stack a couple in an open corner of the room to fill a void and add a pop of color. 6. These baskets from Land of Nod are perfect for the existing shelving in Jess’s family room. They are great for storing toys, magazines and remotes. My mother in law picked up some super cute ones at a fraction of the price at Tuesday Morning as well! 7. Finally, the pillow. The classic couch staple. Add a few in coordinating colors and sizes to finish off the new comfy family room. 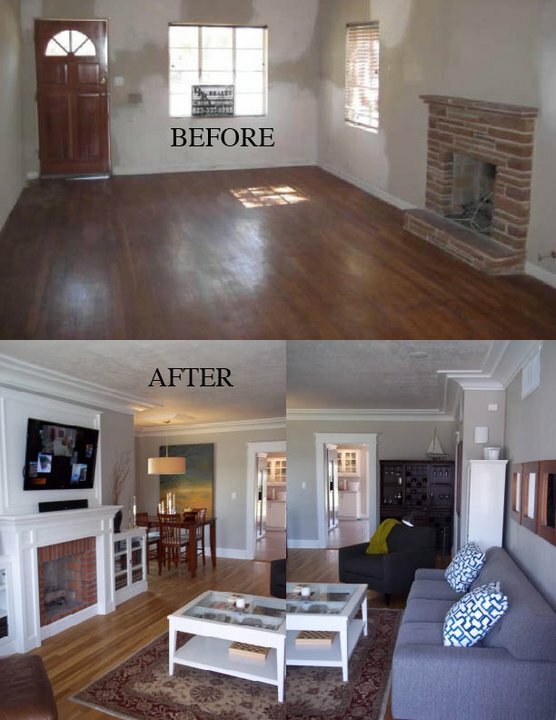 I hope we were able to give you a bit of inspiration for your family room makeover. You’ll have to add the most important part of course, and that’s your beautiful family! Keep us posted on your projects!